The New Mexico Military Institute, located in Roswell, NM, is the nation’s only state-supported co-educational military boarding school in the nation offering an integrated four-year college prepatory high school and university parallel transferable junior college. On September 3, 1891, the Goss Military Academy was founded through the efforts of Captain James C. Lea and Colonel Robert Goss. With an initial enrollment of 28 students, including female students, the school was the first in New Mexico to adopt military features. 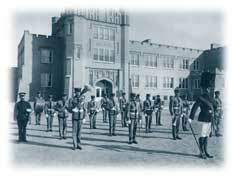 The Academy was later made a territorial school and renamed New Mexico Military Institute in February 1893. However, there were no funds appropriated by the Territorial Legislature and the Institute suspended operations for two years. On February 13, 1895, an appropriations bill passed by the Territorial Legislature provided a bond issue and maintenance funds contingent on the provisioning of a 40-acre tract of land for the school. Mr. J.J. Hagerman deeded the 40 acres of property on North Hill, the Institute’s current location, and the school became a fully recognized territorial entity under the Legislature. A new $12,000 physical plant was built that housed 105 male students during school year 1896. At that time the curriculum consisted of as many as eight years of academic work and students were organized into two cadet companies. In 1906, the Reserve Officer Training Corps (ROTC) was introduced. In 1909, the War Department designated the Institute as one of the ten distinguished military schools in the nation, a distinction the Institute has earned annually since. Being so designated enables the Institute to annually nominate eight deserving cadets to attend the nation’s military academies. Today, the Institute sends approximately 80 cadets annually to attend the nation’s service academies through its Service Academy Preparatory Program, the largest of the five military junior colleges serving the nation. In 1915, the Institute took on its modern form when a junior college was inaugurated. The Institute now had a four-year high school and a two-year junior college and was quickly becoming recognized throughout New Mexico and the nation as a pioneer in education and the development of young people. During World War I, the Institute sent 320 young men to the defense of their nation. Of these young men, 163 served as officers. Many of those who served received distinguished service recognition and medals of high order. In 1917, the Institute’s high school became a charter accredited school of the North Central Association of Colleges and Schools. IN 1932, NMMI’s junior college was accredited by the Higher Learning commission of the North Central Association. NMMI has since remained the only state-supported, nationally accredited, college preparatory military high school and junior college in the United States. During World War II, Institute graduates saw service in every theater of the war. Over 150 Institute graduates gave the last full measure of devotion to their country. Institute alumnus John “Red” Morgan was awarded the Medal of Honor, and other alumni distinguished themselves in combat. During the Vietnam War the Institute again sent its sons off to conflict. And, again Institute graduates gave of themselves for the nation. In 1977, full-time female students returned to the Institute and their numbers have steadily grown. Women now number about 20 percent of the Corps population. 1998 saw another first, as the Corps of Cadets was led by its first woman Regimental Commander, Heather Christensen of Roswell. Since then three other women, Lindsey Schuda, of California, Daniell Valerio, of New Mexico, and Sara Brown, of New Mexico have served in the top cadet spot. In 2003, the Institute appointed its first African-American to the position of Regimental Commander, Cadet John White of Houston, Texas. In 2004, Cadet Luis Aranda was named as Regimental Commander, earning him the honor of being the first RC from Mexico. 2004 provided another first as NMMI welcomed Rear Admiral David R. Ellison, as Superintendent. And, in January, 2005, NMMI welcomed back Brigadier General Richard V. Geraci, a 1975 graduate of the Institute, as Commandant. In 2010, another first came with the installation of a National Guard Flag Officer as Superintendent. Major General Jerry W. Grizzle, US Army National Guard (Retired), took on the daunting task of leading the school out of a decade long decline in enrollment. School year 2011-12 saw MG Grizzle’s efforts bear fruit as enrollment climbed to 960.